Out of the many bottles that have made their way through my door, this one caught my eye. For those of you who don’t know me well, my affinity for alcohol usually doesn’t stem too far from wine, beer or fancy-fun martinis. My introduction and knowledge of scotch has generally been at arms length, with the occasional tasting. 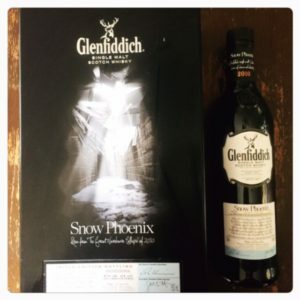 In this post, I will provide a brief overview of the story of the Snow Phoenix single malt scotch and my experience with it. The year was 2011. The pictured limited release of Glenfiddich single malt scotch whisky in its decorative tin, the “Snow Phoenix”, became available in Liquor Stores in Ontario, Canada. In January 2010, after an extraordinary winter at the Glenfiddich Distillery in Dufftown, Banffshire, Scotland, four of Glenfiddich’s warehouses collapsed under a huge weight of snow. The Snow Phoenix limited edition bottles were made from a selection of the finest aged oak casks not damaged by the collapse of the warehouse roofs. Glenfiddich’s Malt Master, Brian Kinsman, chose to marry a variety of the finest aged oak casks left intact from the snow damaged warehouses for the unique production of the Snow Phoenix. Some of the casks used had previously held Oloroso sherry and some had been made using American oak, each was chosen to make a unique contribution to the taste and aroma of the final scotch whisky. The Snow Phoenix was named as such, as it was risen from the great warehouse collapse of 2010. The night I first tried the Snow Phoenix wasn’t the first night that I had run out of wine and turned to the eclectic liquor cabinet for options. Any bottle of alcohol that is featured in a tin/box/satchel bag, I view as having MORE importance – duh! I texted my boyfriend at the time and asked if it were fine if I try a bit of scotch? I don’t recall his answer per se, but likely it was “OK, you’re out of wine, I’ll try to pick something up on the way home.” – meaning: “NO!” But that didn’t stop me, I blindly tried the Snow Phoenix that night and learned its story. The Snow Phoenix was created and crafted following an accident. It had, as the Glenfiddich Distillery notes been “born of chance and adversity”. This incident at Glenfiddich Distillery was beautifully and creatively handled by their staff and management. Glenfiddichs’ team deeply appreciated the importance of the Cairngorm Mountain Rescue Team’s work, who’s volunteer staff battle extreme conditions every winter. Glenfiddichs management made special contributions to the Cairngorn Mountain Rescue Team’s funds following this event to allow for adequate continuance of their work. I happily remember enjoying the Snow Phoenix that night, and reflected on aspects of chance and adversity in my own life with ease – until our front door unlatched and I saw the look on my partner’s face 😲 !! PREVIOUSCoconut Easter Nests: To Keto or Not to Keto?! NEXTFor the love of birds!